Saunders Medical Center ER Team is available 24|7 to serve critically ill and seriously injured patients. 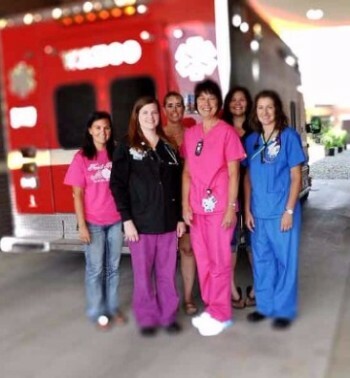 Our staff are trauma certified and trained in advanced cardiac life support and pediatric advanced life support. If you have an emergency, call 911. Each patient is given individualized care with availability of additional services, such as: CT scans, X-rays, MRIs and lab services for quick definitive diagnosis and treatment. We are ready to assist you and your family with the best possible care! Covering the topics of helicopter scene safety and hemmorrage, Saunders Medical Center hosted a county-wide EMS training event. LifeNet visited during the event. Thanks to all the first responders, nurses, doctors, PA's and others who devote their time to providing the best possible emergency care that is so vital to our communities! You will receive immediate care for your emergency. You will be asked for information about yourself, your family, your doctor, employment and health insurance. You will also be asked to sign a consent form for your care. This allows us to treat you in our Emergency Department. Parental consent or consent of a legal guardian is required for children (18 years or younger). Please bring current insurance cards with you if possible.